If one were to sum up the entire body of work of this renowned soil biologist and ecologist in one word, it would be earthworms. 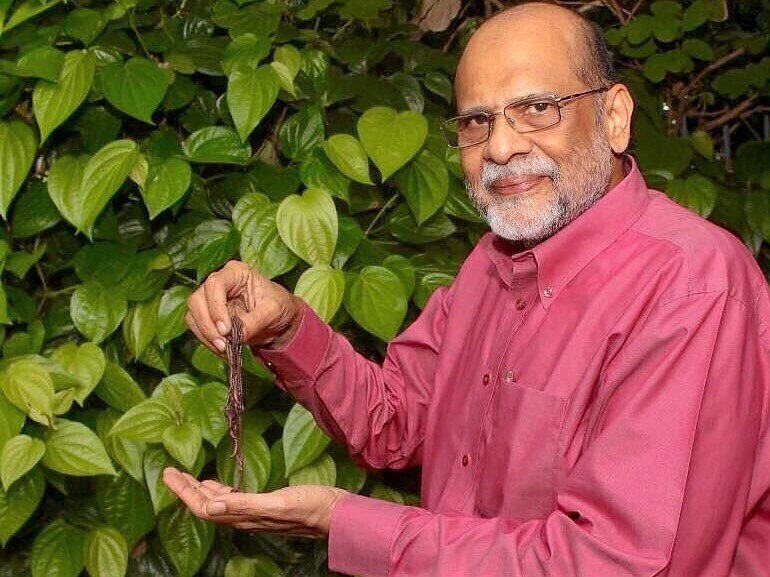 Dr Sultan Ahmed Ismail’s lifework is centred on the techniques for recycling biodegradable waste into fertilizer using local varieties of earthworms and soil bioremediation. Dr Ismail, MD of Ecoscience Research Foundation, Chennai, has conducted extensive awareness sessions especially among schoolchildren to promote vermicomposting and environmental awareness. For him, the two are inseparable. Here’s his statement—reproduced verbatim—on 24-hour or automatic composters being manufactured and sold all over India by various firms claiming that their machines produce ‘compost’ in just 24 hours or sometimes, 48-72 hours. The natural composting process goes through a series of biological sub processes: first action by mesophilic microorganisms on the C-substrate—the metabolic process produces heat (raising the temperature of the compost pile)—resulting in a subsequent second action by thermophilic microorganisms. When all of the C-substrate is depleted, the metabolic activity slows down with the temperature dropping and the mesophilic organisms becoming active while the thermophiles become dormant. This is the cure stage. The whole process in a natural system takes about 30 days (minimum). The 24-hour machines do not produce compost. They produce an end product of pulverised material. Short-circuiting this natural biological process play in composting is not acceptable and claims that these 24- or 48-hour thermal treatment process produces “compost” is misleading and wrong. By analogy, a baby takes 9 months in a mother’s womb to be fully formed and delivered. One cannot short-circuit this and have a baby delivered in one or two months. One should not violate Nature and its processes if we want to be environmentally responsible. The 24-hour composting machines are just waste disposal or waste reduction machines with or without using microorganisms. I am afraid these materials can be used as feed. Care must be taken that these end products neither reach the soil nor the feed because stabilisation continues till completion of the decomposition of degradable organic compounds and re-organisation of other organic substances, which takes its own time depending on the constituents. There is no microorganism so far found that can hasten this process to be completed in 24 hours. If this “compost” is used without full stabilisation, it may prove to be harmful to the plants and also to the soil. This 24-hour process from machines can be useful probably to reduce the volume of waste for landfilling or for further processing. The recommended C:N ratio for composting is about 30. This goes through a stabilisation process to end by less than 20 preferably 12 to 14. pH of a good compost should be neutral preferably 6.5 to 7.5. Good compost shall have an average value of N as 1.2 to near 2. Phosphates (P2O5) of about 0.8 to 1; and potassium (K2O) of about 0.4 to 0.8. There can be a variation in these values depending on the quality of the input material. I would also like to strike a note of caution that C:N ratio or pH or any nutrient of a soil or compost sample can be adjusted by adding certain external agents before testing. As such, adequate precautions should be taken to ensure that the samples are not fortified with before testing. Moreover expired medicines, domestic sanitary waste, heavy metals from used and broken tube lights and thermos flasks may also find an entry contaminating soils, unless drastic precaution is taken as done in regular composting. To sum up, composting is a natural biological process which cannot be completed in 24 hours. The process has to complete in its natural cycle, which can take a minimum of 30 days but continues even after that when mixed with the soil. The 24-hour process can at best reduces the volume so that it can be used for landfilling or for further processing. It may be harmful to the soil if used as ‘compost’ and to all the produce of that soil using this so-called ‘compost’. This entry was posted in 24-hr Composting Machines, Endlessly Green and tagged 24-hour composting, automatic composters, earthworms, ecologist Dr Sultan Ahmed Ismail, organic waste converter, OWC, soil pollution. Bookmark the permalink. ← Community composting method-16: These composters can solve city’s dry leaves burning problem. Is BBMP listening? Gandhi had prophetically observed, “The world has enough for everyone’s need, but not enough for everyone’s greed.” Would that we heeded him! — because, at the root of all human attempts to accelerate Nature’s way of caring for the Earth and all the life forms it sustains, is that greed Gandhi had referred to. Everywhere I look, I see this mounting desperation to mindlessly make money fast — and more and more money, faster and faster — and I wonder how it is that humans have sunk so low. Your post, which brings the insights of Dr Ismail’s mind to those of us less knowledgeable, must be commended; and its message spread wide. And it will if I and each of my fellow readers do our bit. And to you, Savita, I say, Never give up. You are doing a wonderful service to humanity by keeping your blog alive with well-researched, conscientiously chosen information. Its impact will live on. Gandhi’s life could be snuffed out; his legacy could not. I am composting in natural form and vermicompost, from the past 10 years. I was planning to buy a 24 hours decompost machine for my Colony, nowadays all the state governments are insisting for buying these machines on war foot basis, some states have given deadline dates also to major appartments hotels, etc., before I wanted to know weather the end product will be suitable for plants or agricultural fields as mannure, today I was going through Google and saw your blog, I really appreciate your efforts to give so much information about this 24 hrs composting machine. I am scared -> if these so called 24 hrs compost ( without live microbes in it ) is used in agricultural fields, ” it would be a big dissaster for agricultural fields. It would be more dangerous than Plastic. Again some companies will come up saying that they got New invention to amend this dead soil. Request you to please educate the state and central government ‘s to stop promoting these Machines. Your blog has given me a eye opening for Natural ways to live with nature. Any news from you side pl be mailing to my id. All the best.